The World Head of the Ahmadiyya Muslim Jamaat, Hadhrat Mirza Masroor Ahmad, the Fifth Khalifa, has called on Muslims across the world to peacefully unite in their opposition to the film ‘The Innocence of Muslims’ which has stirred up great resentment and anger amongst Muslims worldwide. He has also called for limits to free speech so that the religious sentiments of all people are protected. During his weekly Friday Sermon, delivered from the Baitul Futuh Mosque in South-West London on 21 September 2012, Hadhrat Mirza Masroor Ahmad said that Muslims across the world had been aggrieved and hurt by the film and also by the decision of a well-known French magazine to once again print vile caricatures depicting the Holy Prophet Muhammad (peace be upon him). Media outlets including BBC National News, BBC Newsnight, Sky News, Sky Arabic, Reuters, the Press Association and various other organisations were in attendance and met with Hadhrat Mirza Masroor Ahmad immediately after his address. Hadhrat Mirza Masroor Ahmad was clear in his condemnation of the violent response witnessed in a number of countries by extremist Muslims. He said that the killings of innocent people including ambassadors and diplomats was completely contrary to the teachings of Islam; he said that damaging property or burning buildings was completely wrong and benefited no party, except those who wished to defame Islam. Addressing the issue of freedom of speech, Hadhrat Mirza Masroor Ahmad said that people should never be too proud to admit that there may be flaws in certain man-made laws or regulations. To treat freedom of speech as paramount at the expense of world peace and harmony was a flawed concept. Hadhrat Mirza Masroor Ahmad also called on the leaders of the world and members of the public to reflect whether they were playing a role in causing hostilities to rise in the world by supporting, at all costs, the right of people to make films or caricatures that offend religious sentiments and hurt innocent people. In reaction to such provocations, Hadhrat Mirza Masroor Ahmad called on Muslims worldwide to display a collective and mature response. He said Muslim Governments and Muslims who live in Western countries should join together to promote the real and peaceful teachings of Islam and of the Holy Qur’an to the world. He said they should take a peaceful and united stand to defend Islam and the noble character of the Holy Prophet Muhammad (peace be upon him) at every opportunity and at every level. His Holiness noted that in recent years such attacks on Islam were increasing and whilst the inappropriate reactions of certain Muslims had to be condemned, he said it should not be forgotten that it was often others were taking the first step in causing such disorder. 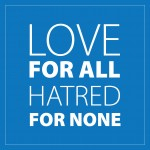 During the press conference that followed the Friday Sermon, Hadhrat Mirza Masroor Ahmad told the assembled media that the love a Muslim has for the Holy Prophet Muhammad (peace be upon him) was unparalleled. He said that all people are hurt if their loved ones are mocked and thus any attack on the Holy Prophet (peace be upon him) is sure to grieve all Muslims. In response to a question about the violent protests following the release of the film, Hadhrat Mirza Masroor Ahmad said that such protests were wrong and that the killing of any innocent people, including ambassadors and diplomats was completely contrary to the teachings of Islam. He said that all protests must be conducted within the scope of the law and remain peaceful.